It probably wasn’t terribly shocking to many that Taylor Swift’s “1989” won album of the year. Or that Ed Sheeran’s hugely popular song “Thinking Out Loud” took song of the year. Meghan Trainor was a well-deserving recipient of best new artist and Bruno Mars’ Uptown Funk swept record of the year. These are just a few of the gold trophies that went out in last night’s ceremony for the 2016 Grammys. Awards make people feel a certain kind of way. It’s important in today’s world to recognize and encourage success. Good people doing good things. 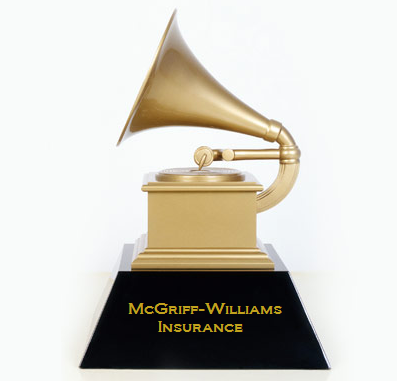 McGriff-Williams has been honored to accept many awards of our own that we’re very proud of and motivated by. “Witness Greatness” was the takeaway message from last night’s show. We feel confident that’s exactly what will happen with random acts of kindness happening tomorrow too. We appreciate the loyalty of our clients over the past 33 years and are grateful for the various acknowledgments we’ve earned. We challenge you to share your admiration of others, especially tomorrow, and hand out your own awards…. Whether it’s a smile for a stranger, picking up the coffee tab for the car behind you or sending a handwritten note to someone you haven’t talked to in a while. We all need to recognize and reward good people doing good things. Whether you plan to attend the summer Olympics in Brazil or not, you’ve probably heard about the Zika virus. Growing concerns of this widespread outbreak have really sparked conversation with potential Olympic athletes and spectators preparing for their trip this summer. U.S. soccer goalie Hope Solo was the most recent to speak out about her concerns. Although this virus in particular can be very dangerous to pregnant women and cause major birth defects, there are other issues similar to this that should be considered by everyone when traveling. Do you know what type of health insurance coverage you’d have if you went outside the U.S. and became ill or injured? For most under 65 individual health plans, you would have whatever your plan offers for out-of-network coverage. This varies based on the plan you chose. For example, the Florida Blue platinum PPO plan in 2016 provides coverage with a $500 deductible + 50% coinsurance up to a $12,500/person out of pocket maximum. These amounts vary for the gold, silver and bronze PPO plans, as well as pre-ACA plans written prior to 2013. For over 65 year old insureds, Medicare parts A and B do not cover care outside of the U.S. Most Medicare supplements (except for K and L) do have coverage with a $250 deductible. As far as Medicare Advantage plans, the Regional PPO provides coverage with a $950 deductible + 50% coinsurance up to a $10,000 out of pocket maximum. Another option to consider is travel insurance. There are several options for policies you can purchase separately from your health care plan. These would provide some health care coverage as well as transportation costs to get home in the event of an emergency or death. There are several different plans available, in which coverage can vary. Be sure to check your specific plan to confirm what’s covered. Whether it’s the Olympics, a tropical island getaway or a backpacking tour of Europe, be sure to add health insurance to your travel plans checklist prior to boarding that flight. Coinsurance is your shared cost, usually a percentage, of a covered health care service. This cost-sharing can range from 80/20 to 50/50. If applicable, this is calculated after the deductible is met. For example, your plan has a $1,000 deductible and 20% coinsurance. The service you received is a total of $2,000. After the $1,000 deductible, your 20% coinsurance is $200. Your health plan covers the other 80. Coinsurance stops when you reach your out-of-pocket maximum. Claiming life insurance benefits takes more effort than you think! Do you know what type of life insurance policy your loved ones have? Do you know what company it’s with? Do you know where to find the original paperwork? Do you know how a claim can be filed on that policy in the event of a loss? If you aren’t able to answer yes to all of those questions (and most people aren’t), this is for you. Oftentimes, consumers sign up for life insurance, pay their premium, and assume that their loved ones will receive a check in the mail shortly after they pass away. Unfortunately, that isn’t the case. Most insurance companies have no intention of contacting beneficiaries when the insured person becomes deceased. There’s also the issue of contact information changing and the excuse that the beneficiary can’t be located. This leaves some work for the family to do but it’s not as overwhelming as it may seem. Chief Financial Officer of the State of Florida Department of Financial Services, Jeff Atwater, is working to implement new processes and procedures to fix this problem. His plan says that soon enough, all insurers will be required to locate beneficiaries and provide their due benefits. If they can’t be found, the unclaimed funds will be turned over to his office (for the state of Florida) to hold on to and continue trying to locate the person it’s intended for. Words of advice: Communicate with your loved ones about the details of your life insurance policy. It’s a tough conversation to have as no one enjoys talking about death but it’s very important. Paying premiums and leaving the insurance company responsible to actually pay out the benefits to your family is not enough. Make copies of paperwork for their records or inform them of your safe place where the documents are kept. If policy details are lost or the beneficiaries are unsure, there are “life policy locator” services such as the Medical Information Bureau that can assist in locating policy information for a fee. More questions about life insurance? We can help! Email Nick Deas at nick@mcgriffwilliams.com. As if tax time isn’t stressful enough, there’s a new form regarding health insurance being introduced this year. Your tax preparer may have mentioned the 1095 form. It comes in a few different formats, depending on what type of coverage you had last year. Since the Affordable Care Act requires all Americans to have minimum essential health coverage (in order to avoid the tax penalty, which also increased this year), the 1095 form is your proof of insurance. Further, there are three different versions of the 1095 form… so how do you know which one to look for and what to do once you receive it? Form 1095-A: this one is for you if you obtained health insurance from the Marketplace/Government Exchange with or without a subsidy. Whether you got a policy from an agent or directly from healthcare.gov, the Marketplace will be mailing this out sometime in February. It will help you complete Form 8962, which is for your Premium Tax Credit (subsidy). This will allow you to reconcile and figure out if you used the correct amount of tax credit and received the right subsidy. If your income was lower than what you estimated, you may receive a larger tax refund. If it was more, you may owe back a portion of the subsidy that was granted. Form 1095-B: this one is for you if you had individual health coverage, not through the Marketplace and not from a large employer provided group plan. This is sent out by the specific insurance company, such as Florida Blue. Form 1095-C: this one is for you if you received health coverage from a group plan and your employer is considered an Applicable Large Employer (50+ full-time employees). This form is provided by the employer with a deadline at the end of March. Some other employees, even if not enrolled in the group health plan, may receive this form to show that it was offered but not chosen. None of them need to be submitted with your taxes. They contain helpful information when filing taxes and answering questions about the health insurance requirements, but you can keep the actual form for your records. Some circumstances may qualify you to be exempt from the health insurance requirement as well as the tax penalty. If so, the IRS will provide you with an exempt code to use on your taxes. For 2015, the tax penalty is 2% of your household income or $325 per adult and $162.50 per child, to a maximum of $975. For 2016, the penalty will increase again to 2.5% of your income or $695 per adult and $347.50 per child, to a maximum of $2,085.